Just two, one-syllable watchwords that any of us can keep and carry forward. One last question: Suppose, Lord Russell, this film were to be looked at by our descendants like a Dead Sea scroll in a thousand years’ time. What would you think it’s worth telling that generation about the life you’ve lived and the lessons you’ve learned from it? The intellectual thing I should want to say to them is this: When you are studying any matter or considering any philosophy, ask yourself only, “What are the facts, and what is the truth that the facts bear out?” Never let yourself be diverted, either by what you wish to believe, or by what you think would have beneficent social effects if it were believed. But look only and solely at what are the facts. That is the intellectual thing that I should wish to say. The moral thing I should wish to say to them is very simple. I should say, “Love is wise; hatred is foolish.” In this world, which is getting more and more closely interconnected, we have to learn to tolerate each other. We have to learn to put up with the fact that some people say things that we don’t like. We can only live together in that way. And if we are to live together, and not die together, we must learn a kind of charity and a kind of tolerance, which is absolutely vital to the continuation of human life on this planet. 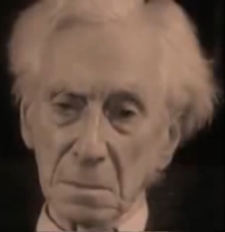 To view the full episode of “Face to Face” with the Bertrand Russell interview, click HERE.